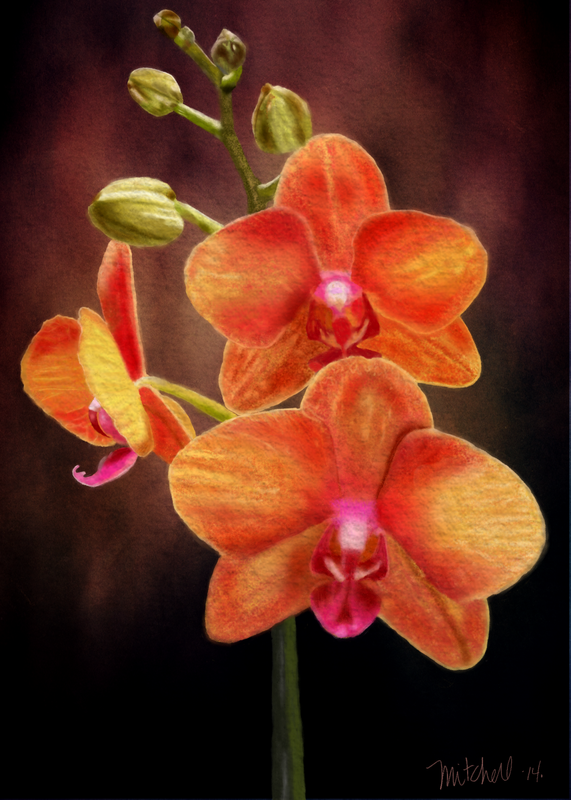 I have taken a Botanical Illustration class at the Digital Art Academy (DAA). They have classes for the app I use to paint, Painter X3. Botanical Illustration refers to the kinds of highly technical drawings that were in vogue in the late 1800’s. I didn’t stick strictly to the style they used back then. I updated it for now. I signed up for this class on a lark. I didn’t know I could paint like this. I ended up kind of dreading the class and wondering what I had gotten myself into. Then, I decided to have an attitude change. I decided to show up, put forth my best effort and have fun. Guess what, I did have fun and amazed myself at what I could do. Awesome Kerry! Wow, it’s an amazing digital painting – the values are spot-on! I love how the flower pops. Beautiful work here. Thanks a lot. This means a lot coming from you. As I said in the blog, I had no idea I could paint like this. It is really fun. You were right: I do like the orchid–especially the quality of the light on the buds. If I may be so bold as to say: For the orchid and the hibiscus, do you think the petals flowers remain just a tad flat? Perhaps they need more light and the centers of the flowers need more dark? I dunno: Just a brush stroke or two of dark to provide more contrast with the lighter areas to give them more life? I’m not familiar enough with the style you were using to know if this is even a valid suggestion, so just ignore me if I’m off base. Having said that, I think the paintings are so wonderful and I think your talent, diligence, and willingness to get advice from your painterly friend/teacher is paying off . You are getting better and better. I really like how you captured the delicate nature of the hibiscus petals. That’s not easy to do. So many painters make them look like leather rather than the tissue-like petals that they are. You captured that quality perfectly. The colours in both, of course, are glorious. Thanks for your input, Carole. Being just a beginner, there is always room for growth is what I say. I have never painted in this particular way, so accurate. It is now carrying over into my abstracts in a way. that is stunning, is that the corel painter x3 you use? I passed your post “I Understand You Don’t Understand” on to family & friends. As a parent & teacher of Special Needs children, I understand the whole “they don’t understand mentality”. From the outside, some life experiences seem so uncomfortable/alien that people can not see all the little things that can become huge challenges to others. Glad to see that you have survived that challenge of dealing with “the Uninformed Blinkered ” and have succeeded in having fun and being creative. Take care. Thank you so much for your comments. I survived, but barely. It has permanently affected me. I love the term Uninformed Blinkered. I’m going to remember that one. As always, your artwork never ceases to amaze and uplift me! Such a God given talent! Thank you so much for sharing! Thank you so much. Your comment just makes my day. It is just beautiful, Kerry! I’m glad too that you “showed up” with a good attitude for the class; otherwise, this painting would not exist. It is lovely! Hi Leigh, Thanks for the comment. I’m so glad you like this. My new computer is being mailed to me on June 16. I don’t know how long it will take to arrive. But maybe after that I can get the hibiscus printed out for you. How beautiful! It doesn’t look digital, it really looks like an oil painting. Congrats! That is spectacular! And ‘showing up’ is the best attitude of all! Hi Claire, thanks for your comment. It encourages me. It’s beautiful! I’m glad the class turned out to be enjoyable and that you surprised yourself with your painting. Those kind of surprises are wonderful! Hi Trisha, I’m so glad you like the orchid. Yes, these kinds of surprises are wonderful! Thank you so much. I really surprised myself with this one. wow!!! It’s amazing what we resist, and then later learn it was a gift. Really love that you were willing to try something new. Hi Kimberly, This was a good lesson for me to keep exploring my painting and see what all God has given me to express. This is really great, Kerry, congratulations! Thank you for the comment. I’m quite pleased with it myself.